In the course of Justice Elena Kagan’s nomination to the Supreme Court, emails came to light suggesting that she had worked on behalf of Obamacare when she was in the Department of Justice. Under normal conflict of interest principles, she would not be able to sit as a judge on a case where the issue is the constitutionality of a statute that she supported as a lawyer. So Congressional Republicans have pressed repeatedly for information on the role that Kagan played in relation to Obamacare when she served in the Department of Justice. The response of Eric Holder’s DOJ has been to stonewall. At the hearing, you were asked whether the Department of Justice planned to comply with the House Judiciary Committee’s letter asking for any documents related to Justice Kagan’s involvement in the health care legislation and related litigation during her tenure as Solicitor General. 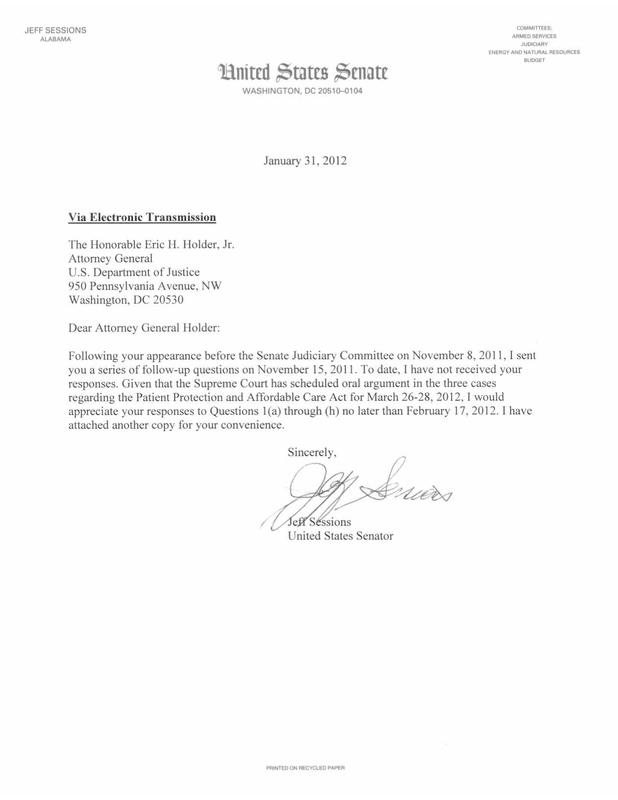 You testified that you were not aware of the request, but that you recalled instances in which your staff would “physically, literally move [then-Solicitor General Kagan] out of the room whenever a conversation came up about the health care reform legislation.” However, during her confirmation hearing, Justice Kagan herself testified that she “attended at least one meeting where the existence of the litigation [in State of Florida v. U.S. Dep’t of Health and Human Services] was briefly mentioned.” In addition, emails that the Department of Justice was compelled to release in response to lawsuits under the Freedom of Information Act the day after your appearance before the Judiciary Committee and earlier this year seem to contradict your purported lack of cognizance of the House Judiciary Committee’s request and your assertion that at all times in this matter Solicitor General Kagan was excluded from discussions and/or deliberations regarding these matters. I am deeply disturbed by these developments and believe that the Justice Department should have provided these documents to the Senate Judiciary Committee during Justice Kagan’s confirmation hearing. The Department’s failure to provide this information to Congress and to comply with FOIA requests, as well as your apparent inattention to these matters, is unacceptable. I have set forth the substance of the aforementioned emails below. Please review them and provide answers to the questions that follow. Also para 27 says the action is being brought before it is signed by President so that no expectations of regularity can be asserted, etc. As such, we could be in court very soon. Then, on March 21, 2010 – the date the House of Representatives passed the Patient Protection and Affordable Care Act – General Kagan wrote to Justice Department adviser Laurence Tribe regarding the health care legislation: “I hear they have the votes, Larry!! Simply amazing.” The subject line of that email chain, which was initiated by Tribe, states “fingers and toes crossed today!” in an apparent reference to the vote. Tribe responded: “So health care is basically done! Remarkable. And with the Stupak group accepting the magic of what amounts to a signing statement on steroids!” – an apparent reference to the group of House Democrat congressmen who had indicated they would not vote for the legislation if it permitted federal funds for abortions and later acquiesced when the President agreed to sign an executive order preventing federal funding for abortions. a. Are you aware of any instances during Justice Kagan’s tenure as Solicitor General of the United States in which she was present in any meeting or conversation in which the Patient Protection and Affordable Care Act and/or litigation related thereto was discussed? b. Are you aware of any instances during Justice Kagan’s tenure as Solicitor General of the United States in which she was asked for her opinion or otherwise consulted, in her capacity as Solicitor General or otherwise, regarding the Patient Protection and Affordable Care Act and/or litigation related thereto? c. Are you aware of any instances during Justice Kagan’s tenure as Solicitor General of the United States in which she offered any views or comments in her capacity as Solicitor General or otherwise regarding the Patient Protection and Affordable Care Act and/or litigation related thereto? d. Are you aware of any instances during Justice Kagan’s tenure as Solicitor General of the United States in which she reviewed any documents in her capacity as Solicitor General or otherwise related to the Patient Protection and Affordable Care Act and/or litigation related thereto? e. Are you aware of any instances during Justice Kagan’s tenure as Solicitor General of the United States in which information related to the Patient Protection and Affordable Care Act and/or litigation related thereto was relayed or provided to her? f. When did your staff begin “removing” Solicitor General Kagan from meetings on this matter? On what basis did you take this action? In what other matters was such action taken? g. As noted above, in a January 8, 2010 email, Deputy Solicitor General Neal Katyal wrote that “Elena would definitely like OSG to be involved in this set of issues.” Katyal later wrote that he wanted the Solicitor General’s office to be “heavily involved even in the dct [district court].” Are you aware of any conversation or meeting in which Justice Kagan approved the involvement of the Solicitor General’s office as described in this email, i.e., “in the [district court],” or the basis on which she justified that involvement? h. Did you ever have a conversation with Justice Kagan regarding her recusal from matters before the Supreme Court related to the Patient Protection and Affordable Care Act? If so, please describe the circumstances and substance of those conversations. Of course Holder will continue to stonewall. The stakes are much too high for ethics considerations to be given weight. The Republicans have no recourse except to public opinion, since the Supreme Court justices themselves are the ultimate arbiters of their own ethics rules. It is noteworthy, however, that liberals have asserted frivolous ethics charges against Clarence Thomas and demanded that he recuse himself from certain cases, while the questions about Kagan are not frivolous at all, but are supported by documentary evidence: and the Obama administration is perfectly comfortable with its preferred manner of responding to issues about its ethics: the stonewall.